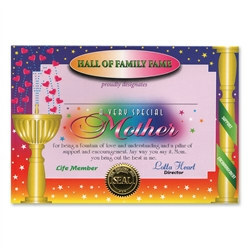 The Very Special Mother Award Certificates are a great way to say I love you. Whether it's Mother's Day or just anytime you want to say you care, the Very Special Mother Award Certificates are sure to do the job. The certificates are bright with lots of color. In the center the certificate proudly proclaims the recipient to be a very special mother. We know that any mother would be received these from her children, husband, or friends. Make sure to also check out the World's Greatest Mom Sash and Super Mom Ribbon.